Shopping for Easter eggs just became a creative adventure rather than a shopping list chore. You have to admit if looking around supermarkets, that the endless rows of mass-produced Easter eggs are totally underwhelming this year. Everyone ends up giving everyone else practically the same gift. Where's the Easter surprise in that? But at Chocolate Grove, chief chocolatier Will Muddyman and his dedicated team have created an incredible range of unique chocolate treats for Easter. Speaking with Will he said: "Our selection of Easter wonders is probably the largest in Melbourne's South East. We have crafted unique, exotic and exciting combinations that move away from the unimaginative and mundane mass-produced products seen on most supermarket shelves." 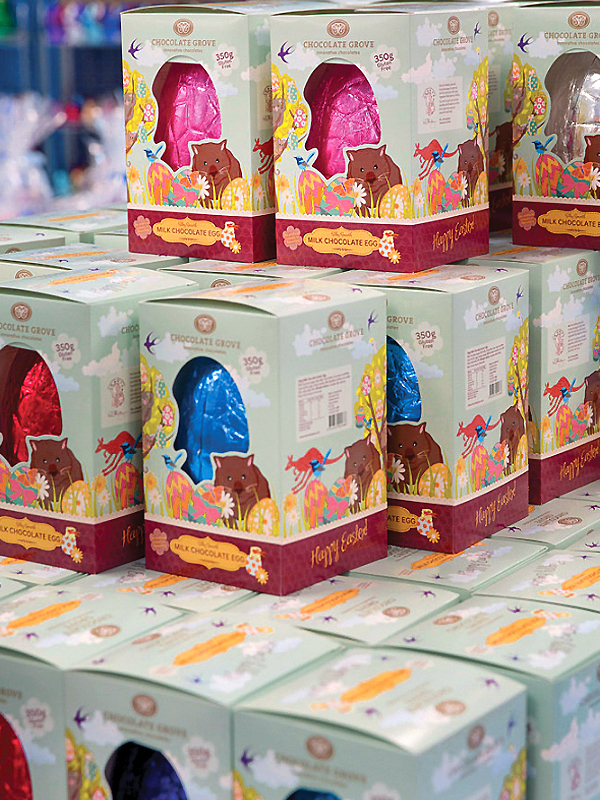 Shopping at Chocolate Grove for your Easter eggs is not a chore its a delight. 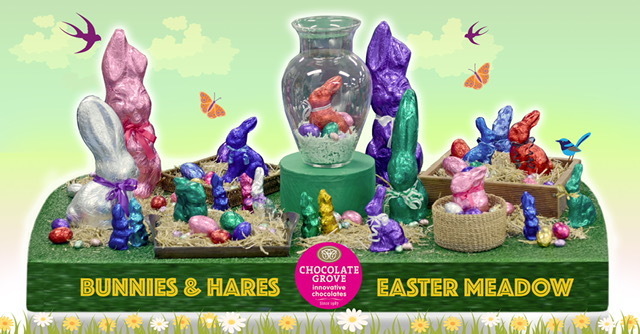 The Chocolate Grove team have designed and created a unique set of stunning tabletop displays that are an attraction in themselves. Kids will adore the presentation called the Seven Wonders of Easter. Displays include Bunnies in the Hay, a Chocolate Covered Football Field, a Crate of Gold Bars, a Goldfield of Gold Nuggets, a Gigantic Gold Egg, chocolate Transformers and Stegosaurus and a gorgeous Eggcentrics "cake". The Eggcentrics term might need some explaining. This is a range of delicious twists on traditional Easter eggs. Each full-sized milk chocolate egg wall is infused with a sweet surprise such as mint crisp, shredded coconut, crunchy honeycomb, butterscotch crisp, fizzy sherbet, crispy cornflakes, popping candy (a favourite with the kids), malted milk, freeze-dried raspberry and freeze-dried strawberry. No bland offerings here! Of course, there are plenty of other Easter treats on offer as well, all stunningly wrapped in a range of eye-catching bright foils. 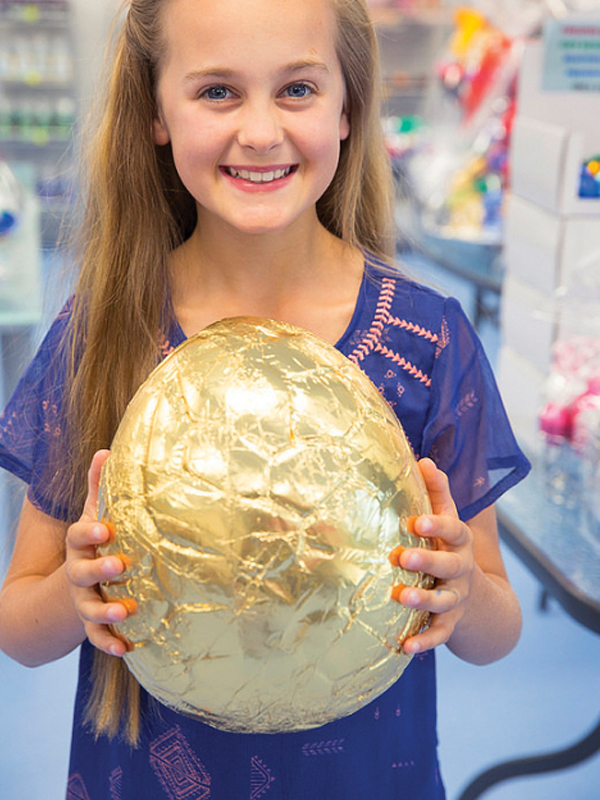 You'll find giant 1 kg Easter bunnies in milk, dark, and white chocolate, plus a wide range of milk chocolate eggs, everything from a miniature 17g to the jumbo-sized 1kg egg. Our family have a game for this giant egg where we all stand in a circle. We toss the egg to each other and step back every time we successfully catch it. Eventually, the circle gets so wide that someone eventually drops it and then we all pounce before divvying up the delicious shards of broken chocolate. 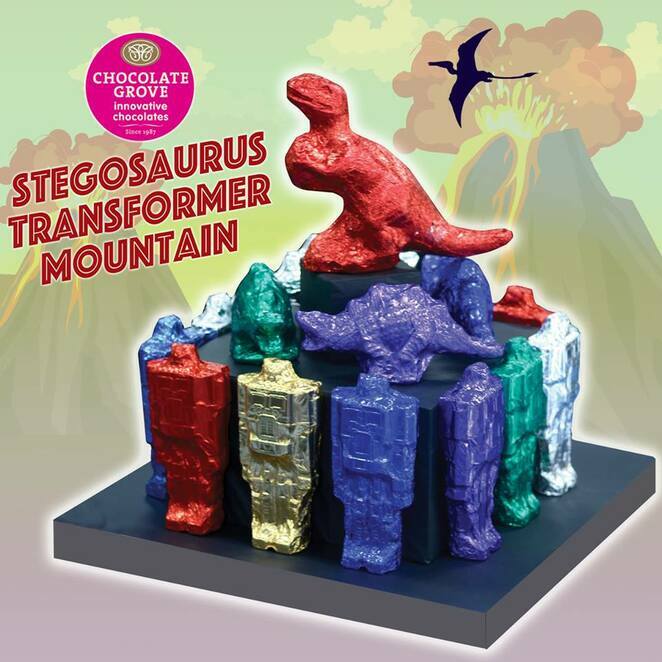 Chocolate Grove also has beautifully illustrated 350g Australiana Easter egg pack, plus a host of novelties such as Stegosaurus, Transformers, chocolate Aussie footballs, gold Bars and 'Welcome Stranger' gold nuggets, chocolate penguins, crocodile eggs and Aussie animals. You'll find Easter hampers packed to the brim with milk chocolate eggs and bunnies, cuddly toys and so much more. Chocolate Grove isn't just open for Easter. 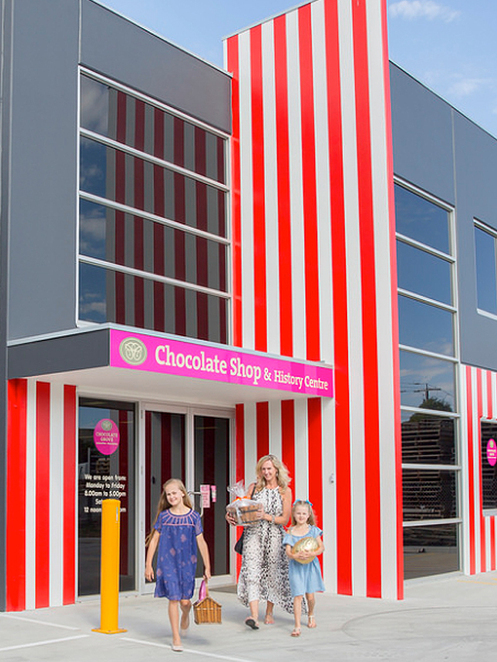 You can call in for their chocolate treats all year long. If you thought there were no new chocolate creations under the sun try some of these – mango spears in milk and dark chocolate, pork crackling, gummy fish, hexagonals (fetta and garlic flavoured corn chips in milk chocolate). 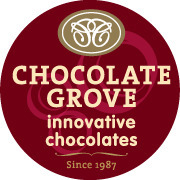 For those who care about chocolate quality and don't just want sickly sweet and mass produced factory made chocolate, the ingredients at Chocolate Grove are all natural. Easter Grove chocolate is made from a dedicated chocolatier with Australian milk powder and sugar, with Ghana cocoa beans. It contains a 28% cocoa mass. While the dark chocolate has a rich 55% cocoa mass. 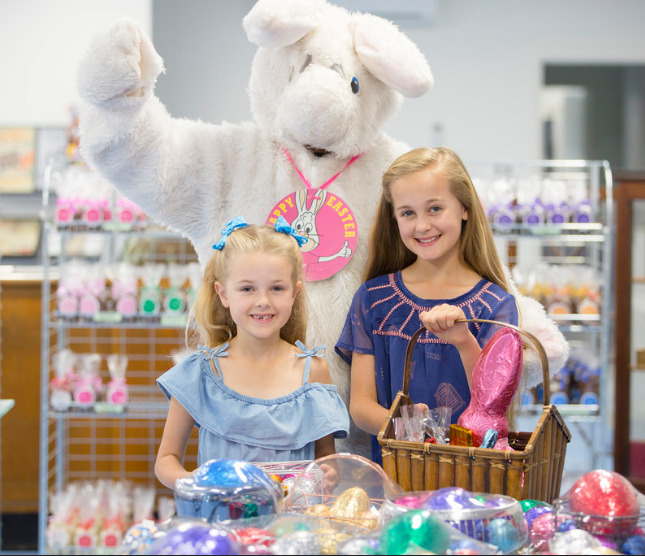 It will be fine to bring the kids even though you are likely to be buying their Easter surprises as they will be busy colouring, looking at the displays, or choosing their own chocolate treats. The whole family will enjoy a wander through the Chocolate History Centre. Will Muddyman has been collecting packaging and advertising material related to Australian sweets, dating back as far as the 1850s. And it all comes together into a great display. The chocolate here also offers great value for the quality of the goods. So make your Easter egg shopping an experience rather than the usual dumping a few chocolate bunnies in the supermarket trolley alongside your routine groceries. Your family will appreciate the change and the novelty of really good chocolate in so many novel forms.